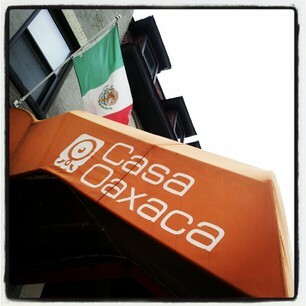 I was greeted by Joanna, Casa Oaxaca's marketing manager, handed a margarita and told the plan. I would be learning how to make Chiles en Nogada from Casa Oaxaca's Executive Chef Alfio Blangiardo. Alfio was born in Tehuacan, Puebla and received a degree from Culinary Institute of Mexico in Puebla and then graduated from the French School of Culinary Arts with Masters in Management of Food and Beverage Industry. 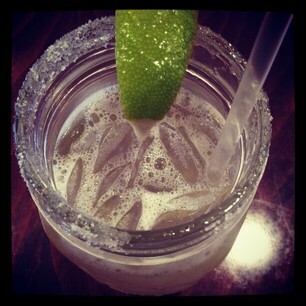 I was incredibly impressed by Alfio's knowledge, attention to detail, organizational skills and love of Mexican food. 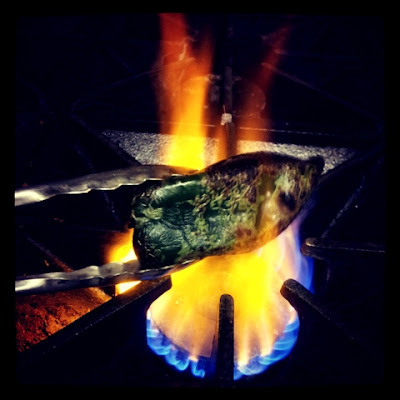 Casa Oaxaca is currently celebrating Chiles Rellenos and Cazuelitas Festival to acknowledge the Mexican Independence and Hispanic Heritage month. If you want to try the special menu, you have until September 30th to make your reservations. 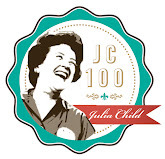 But let's chat about Chiles en Nogada. 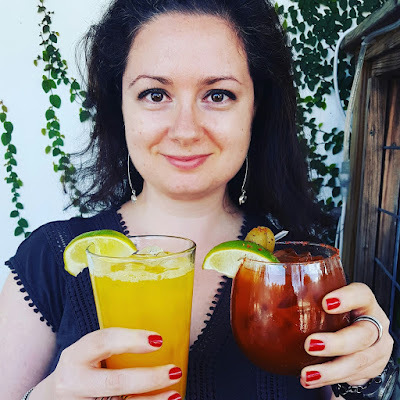 According to Joanna, in 17th Century in Puebla, local Mexican produce was mixed together with the ingredients brought in by the Spaniards to create unique and delicious flavors. Chiles en Nogada came just from such a combination. The dish was originally made for the first Mexican Emperor Agustin de Iturbide towards the end of the Independece movement in 1821 and is now considered to be Mexico's National Dish. 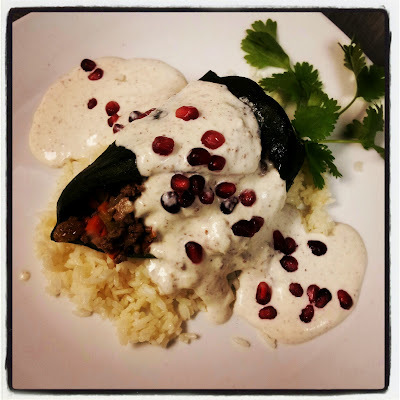 The dish resembles the Mexican flag: green is represented by the poblano peppers, white is represented by the nut sauce and red is represented by the pomegranate arils. 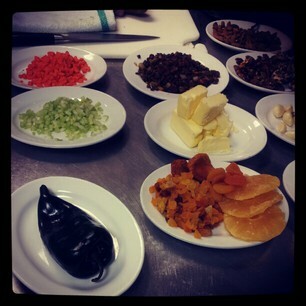 Are you ready for the list of ingredients?? meat previously seasoned with salt and pepper. Add the golden raisins, dried fruit and fresh fruit. 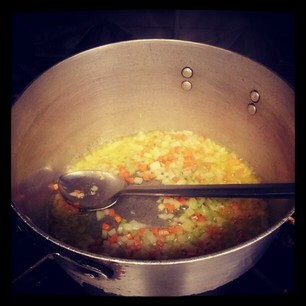 2) Cook the mixture at low heat for 20 minutes stirring constantly. Continue incorporating the tomatoes, almonds, and herbs. 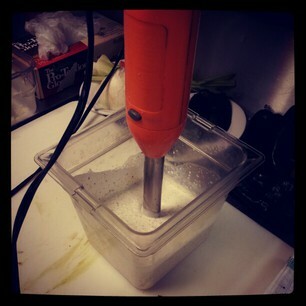 Keep cooking on low heat until the mix has thickened. slightly charred. Immediately transfer to a bowl and cover. Let stand for 10 minutes. 2) Remove the chiles from the bowl and carefully rub off the skins (you might want to wear plastic gloves or use a fork). Cut a slit lengthwise in each chile and carefully remove the seeds and veins. 1) Grind the walnuts and almonds together and add the milk slowly to avoid making it too watery. 2) Add the cheese and heavy cream and the rest of the ingredients. 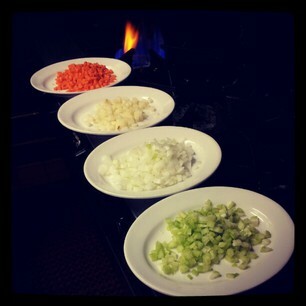 Pour the sauce into a bowl and add the shredded onions, cinnamon and Sherry. Refrigerate for two hours. The sauce should have a semi-thick consistency. 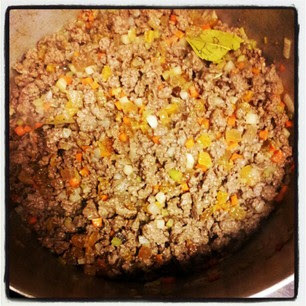 1) Stuff each chile with about 4 ounces of the filling mixture. 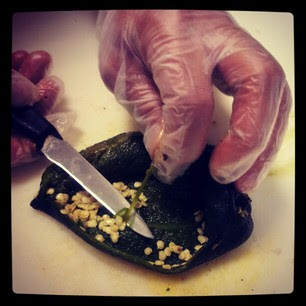 2) Place stuffed poblano chiles on top of rice and pour about an 2 ounces of the sauce on top. 3) Spread some pomegranate arils and parsley or cilantro leaves on the sides. Serve at room temperature. This was a complex dish with an incredible combination of flavors. I seriously have never tasted anything like that. I bet that's not how most of you picture Mexican food. I realize that the recipe is quite complicated, but I think you can take a few shortcuts and still have a delicious result. 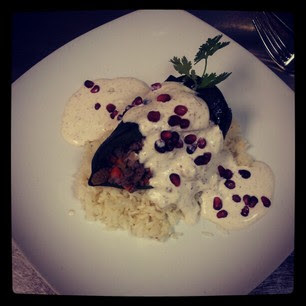 Have you ever tried Chiles en Nogada? What are some of your favorite Mexican dishes? BIG thank you to Joanna and Alfio for an educational, boozy and flavorful night. hm... all pics except 2 are broken :( btw, your home button looks fine to me!